It is time for an Arab-Israeli peace deal. And it has to happen soon, because the moment is auspicious and it will not last. We currently have a “window of opportunity” – an English term that has been adopted in many languages including those of the Middle East. Solomon was by no means a naive monarch who sought peace at any cost; he was an experienced politician who understood something that many a more recent politician has refused to recognize on principle, namely that in the real world the use of force by a state can sometimes not be avoided if the outbreak of greater wars and the dominion of the most ruthless are to be prevented. Considering the dilemma of good intentions in the empirical world, the German sociologist Max Weber (1864–1920) developed the concept of an ‘ethic of responsibility’, whereby an agent considers the possible effects of his actions, and the contrasting concept of an ‘ethic of conviction’, whereby the unbending commitment to, say, peace can have catastrophic consequences. One example of the latter might be the appeasement of Nazi Germany by Britain and Francein the 1930s. The time has come for peace in the Middle East. 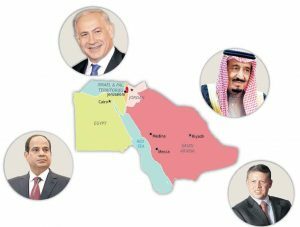 The decisive reason for that is that the Jewish state is surrounded right now by neighbors willing to make peace: Egypt, Saudi Arabia and Jordan. The exception is Lebanon, which is ruled by the Shi’ite Islamist Hezbollah. Relations between Israel and Egypt demonstrate the very real power of peace. Those relations were first marked by war: Since Israel was established in 1948, the two countries fought three wars – in 1948, 1967 and 1973. The hostility towards Egypt dates back 3,500 years, when the Israelites were enslaved there. In the 20th century, war and violence seemed to be the inexorable fate binding Israel and Egypt to each other – until 1977, when Egyptian President Anwar Sadat decided, on the spur of the moment, to accept an invitation from Israeli Prime Minister Menachem Begin to come to Jerusalem. Sadat held a revolutionary address before the Knesset. He welcomed Israel among the Arab states, which until then had all been at war with the Jewish state, but he demanded in return that Israel withdraw from all the Arab territories it had occupied in 1967 and that it make peace with the Palestinians. Israelis were ecstatic about Sadat’s offer of peace. Some ministers thought there was room for a deal whereby Israel could keep part of Sinai, but Sadat would not budge. He insisted on Israel’s full withdrawal from the peninsula. The nationalist Begin realized that Sadat’s offer was genuine: Either Israel accepts his terms and there will be peace between the two countries, or the historic opportunity will be lost. The prime minister and his foreign minister, Moshe Dayan, chose peace and ordered a complete pullout from Sinai. It was a painful decision. Just four years earlier, in the 1973 Arab-Israeli War, Israel had avoided a military catastrophe thanks to the strategic depth provided by its occupation of Egypt’s Sinai peninsula – the only place Israel’s army had any scope to pull back. Nonetheless, Begin’s government chose to accept Egypt’s offer. At that time, the Israelis understood that peace would make their country much safer than would strategic depth plus enmity, which would have meant the continuation of the series of wars with Egypt. Peace has never reigned eternal, especially in the Middle East. The region is currently being ravaged by several wars. The civil war in Syria has killed more than half a million people, wounded countless more and driven millions from their homes. A civil war is also raging in Yemen, where the Shi’ite Houthi militia are attempting to seize control and are also threatening Saudi Arabia. Aggressive Islamist forces are controlled and supported by Iran. Its Shi’ite regime is open about its goals of destroying Israel and becoming the leading power in the region. Tehran wants to topple the moderate governments in Egypt and Saudi Arabia and replace them with Islamist ones. Cairo, Riyadh and Amman know that, unlike Israel, Iran represents a strategic threat. They are ready to make peace with the Jewish state. The principle is the same as it was for Sadat and Begin: land for peace. In 2002, Saudi Arabia launched its own peace initiative, tying the normalisation of relations with Israel to the creation of a Palestinian state. Saudi King Salman, who has been in power for two years, and his son, Deputy Crown Prince Mohammed bin Salman, have also stressed their readiness for peace. They want to use their country’s economic potential to ready Saudi Arabia for the future, in line with their Agenda 2030. But Hamas does not represent a strategic danger to Israel. What is decisive is that peace between Israel and the major Arab powers Egypt and Saudi Arabia and Jordan, whose population is 70% Palestinian, would develop its own dynamic. The atmosphere of a general Arab-Israeli peace would force the Palestinian political leadership to address the needs of its people and redirect its efforts away from a conflict with Israel that it cannot win and towards a political resolution. For its part, Israel would be well advised to withdraw from most of the Arab territory it has occupied. As Prime Minister Benjamin Netanyahu recently put it in Washington, Israel does not want to rule over two million Palestinians. He should draw the consequences and form a stable coalition government with the opposition forces that are committed to peace in order to focus on the goal of creating rapprochement. Now is the moment. It must not be missed.